This report presents analysis of a baseline household survey for the Rwanda Climate Services for Agriculture project – a four-year, USAID-funded initiative that seeks to benefit Rwanda’s farming communities and national economy through climate services and improved climate risk management. The survey intends to provide a baseline assessment of the state of climate services among agricultural households in Rwanda. A random sample of 3,046 respondents was nationally surveyed in the all four provinces of the country and in the city of Kigali. A total of 52% of the sample were female respondents, while two-thirds of the households interviewed were male-headed households. The baseline includes outcome indicators related to access, use of climate information, channels of communication, behavioral change and perceived livelihood benefit/impact. The project evaluation will involve assessing changes over time in these benchmark indicators and eventually comparing the changes across beneficiaries and non-beneficiaries. A qualitative component of the evaluation will provide deeper insights into users’ decision making, behavioral change and any socially differentiated effect. Coulibaly JY, Birachi EA, Kagabo DM, Mutua M. 2017. 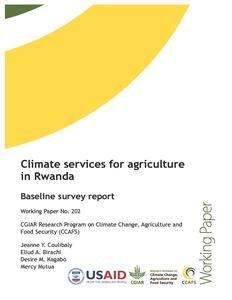 Climate services for agriculture in Rwanda: Baseline survey report. CCAFS Working Paper no. 202. Copenhagen, Denmark: CGIAR Research Program on Climate Change, Agriculture and Food Security (CCAFS).